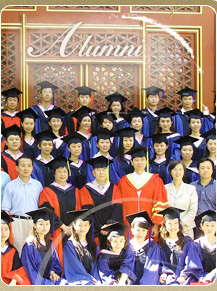 The Alumni Association of Central Conservatory of Music was established in 1990s. It currently has several branches, such as CCOM Alumni Association branch of North American, Shanghai, Hong Kong, Tianjin, etc. The CCOM Alumni Association seeks to serve and engage all CCOM alumni and students; to foster a lifelong intellectual and emotional connection between the conservatory and its graduates; and to provide the conservatory with good will and support; to promote the academic, cultural, business and educational exchange and cooperation with other worldwide research, cultural, business and educational institutions. The Alumni Association of CCOM will establish the contact information net gradually and try the best to represent some important news related to alumni's achievements and contribution to the society.